The first small steps are being taken in a new marina and amenity project which will boost Aitutaki’s popularity with visiting yachts, encourage new businesses and provide new jobs. The Aitutaki Orongo Development Project, a joint venture between the Cook Islands Ports Authority and the Aitutaki Island Council, will involve deepening and widening the existing Arutanga harbour channel and basin to allow yachts and cruise ship tenders to safely berth. It will also accommodate inter-island shipping. 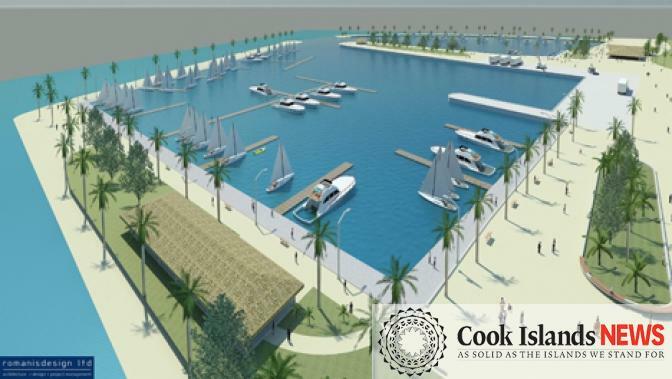 However, the jewel in the crown of the project will be development of the area in front of the island’s fishing club to allow up to 200 yachts to berth, which in turn is expected to give the island’s tourism revenues a healthy boost. It will involve demolition of the old Orongo Centre building which was severely damaged in Cyclone Pat which devastated the island in 2010. The building was totally ruined and has been condemned, says Tou. A new two storey community and commercial centre will be constructed to replace it, with small shops on the ground floor and offices on the top floor, says Ports Authority chief executive Bim Tou. The Aitutaki Island Council’s chambers will also be located in the building. The complex will feature what Tou describes as a ‘modern’ toilet facility, construction of which will begin soon. Tou says dredging and widening the harbour channel and the basin will allow much larger vessels into the harbour, while the marina facilities will help the island to attract some of the 1000-plus yachts estimated to sail past Aitutaki each year. No completion date has been put on the ambitious $15.5 million project, but it is listed among the top 10 most important investment plans in the government’s infrastructure investment plan, says Tou. At this stage, the plan is to stage the project over five to 10 years. The project was first mooted back in 2012 when a feasibility study was conducted. Environmental assessments have since been completed.